Doc joins me to discuss some of the moves he is expecting for the gold stocks and actual gold price. This time of the year the PMs tend to selloff but Doc still thinks the downside is limited. George, unfortunately, I sold my palladium last fall—probably should have waited although will take a 200-300% profit any day. The price is starting to look a little parabolic here and it’s left longer term moving averages in the dust. I believe palladium is a metal on its’ own mission and fundamentals here and isn’t a direction vector for the rest of the precious metals. gld:$indu fell below cloud support on the daily chart (actually occurred on Feb. 4). Not a good sign at all. Conventional reading of this would be that gold is going lower vs the Dow over the next couple of months. Pretty pathetic that gold couldn’t even keep itself in a clear bull trend vs the Dow after all the bashing the stock market has received as being a bubble, etc. The ratio is backtesting the underside of the cloud today. Expect a spectacular failure tomorrow or next. We get to look forward to the summer doldrums in a few weeks. Like Doc says, down down down we go. Funny, the other day I was seeing silver shortage articles again. lol Some things just dont seem to change. I dont like when Doc says the next week or so is important, next week or so tells a story. PMs always seem to tank. I think the hope is some of the shares have plain ol run out of sellers. Thx for the interview guys. If I was truly rational I should sell my miners today. But I won’t because I don’t know what else to do and I have held these turds for coming up on 3 years now. Nobody can predict a controlled substance……..London are the controllers….. 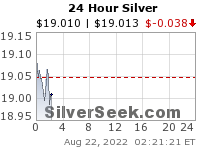 I wouldn’t be shocked to see a very large drop in silver in the next 2 trading days on the order of 40 or 50 cents. If Powell’s FOMC couldn’t light a fire under gold and silver, nothing will short of nuclear war. And that will be a literal fire. After the short term top exactly three years ago, silver fell more than 8%. A repeat of that action would send silver down almost another dollar from here. Well, given how poorly my silver miners are acting in the face of rallying silver (they did the opposite in 2016), if silver drops 8% from here, they will be making new lows. You have to ask yourself why that is? Wouldn’t the smart money be stepping in and be buying silver miners like EXK and AG hand over fist if silver was going to be making higher highs and higher lows??? If we look at the silver miners generally, what’s wrong with the picture? SIL touched an overbought reading (again) and, since then, hasn’t even backtested the 200 day MA (which would be normal/healthy). And since the 200 day MA is still falling, we just might have to put up with some sideways action (down and up in a range) for a week or so. Maybe I am putting too much emphasis on GCC’s horrific looking Ichimoku cloud on the weekly chart. But probably not. I don’t see SIL getting through its cloud if GCC doesn’t. And GCC looks doomed for the rest of this year to be frank. At best it will retest to 2016 low yet again and crawl up for the rest of the year. At worst it makes a significantly lower low and continues lower for the rest of time. lol. Doc, how low do you think gold and silver will go during this tie of year? Will gold hit 1250 or just shy of 1300? Pardu, I believe the PMs won’t drop out of bed but just work their way lower over the next 3-4 months. 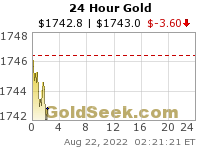 As I’ve mentioned in the past, gold could move as low as 1220. To me that’s not a huge loss and would keep it in its’ trading range on the monthly chart which I feel is paramount. Lower for 3-4 months, then the doldrums. Real estate drifting lower, stocks at all time highs, cash is looking like a good place to be. The higher silver goes, the lower EXK and AG go. Let’s see if I have this straight. The minute the Fed cries uncle and says it is pausing rates hikes and that they will consider slowing their balance sheet run off, gold proceeds to tank vs the the US stock market almost straight down for a month. Makes perfect sense! Surprisingly SLV:$indu is still holding above its cloud on the daily chart. Unfortunately, I expect it to drop below the cloud by Monday. I don’t think there is any way it hold support. The drop will probably correspond with a break in SLV:GLD too, which is vulnerable for the next few trading days. I am probably being way too pessimistic. I’ve been conditioned for it now. I have to admit, $gold:$indu breaking down below cloud support already on the daily chart is very surprising and disturbing to me so soon after gold looked like it was unstoppable and things were unraveling on the Fed. You would not expect that if $gold were truly getting ready to break out to the moon. Another red herring thrown in by the banksters? Maybe. I am also probably overly pessimistic because I am overweight underperforming silver miners like EXK and AG, which havent’ really done diddly squat are are still essentially scraping bottom looking like they want to head even lower in relative and absolute terms. The though of lower lows now is frankly upsetting. Good point Marty. David looks a bit worn out and has gotten more into the Energy sector lately to shift his focus. Don’t wanna end up “Serfing” USA!